The Crooked Banana: SMS Giveaway Day! Hello and welcome to my little blog! If you've never visited before, my name is Anna and I like to sew. And knit. And crochet. And cross stitch. Ahem. I just like to make things ;) I hope you'll stick around and have a little look around! But first, I know you came here for some goodies. So here's what I have on offer today. 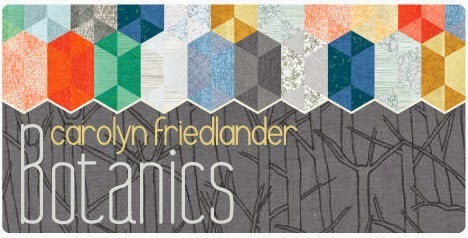 Two charm packs of Carolyn Friedlander's Botanics! I think I may have had a plan when I bought these. But if I did, I never wrote it down and now it's long gone. So much better that they're sent off to a nice, new home, right? All you have to do to enter is leave a comment on this post. Followers get a second entry (and let me know how you follow! Always curious!). I am happy to ship internationally, too! Giveaway will close this Friday, May 16th and I will choose a random winter this weekend for shipping Monday. Please make sure to include your email address in your post if you suspect you're a no reply blogger! Thanks and good luck! And once you're done here, be sure to head on over to Sew Mama Sew to enter all the other great giveaways! And I'm a Bloglovin follower! I've been admiring this line of fabric. Lovely! Oooooh, I love charm packs! Thanks for the giveaway! I would love to have some of this line! I think they are great fabrics. Thanks for the giveaway! These charm packs are so pretty. They would make a nice lap quilt. oh Botanics - what a giveaway :-) Love the colours in this fabric line. Love Botanics! Don't you hate it when you don't write down your plans? I love this line of fabric with all of the low volume prints! I have yet to complete anything using some only because my stash does not have enough in it yet to complete a larger quilt! I follow you on Blog loving and thank you for all of your great posts! I do that too! I have stacks of bits and bobs that had a specific purpose once upon a time.... I was once told that I have a terrible memory , but an excellent "forgettery"
I love this fabric line, but I don't have any of it. I know just what I'd do with it if I win too! It would be wonderful to be able to play with this line! I love pretty much all the prints in that collection! love this fabric. I need a new table runner this would be great. Thanks for the chance. I love blender fabrics! I use many in my miniature quilts. I love this line. And charm packs are great for doing HST quilts. Thank you for the chance! This is such a great line! I have that same problem where I find fabric that I know I had a plan for, but it's long forgotten :) Thanks for the chance! Botanics is such a beautiful line! Thanks for the chance to win! Love these fabrics! Thanks for the giveaway! What a lovely line, very "blendy". These are so pretty - thanks for the opportunity! Love botanics! Thanks for a chance to win! oh I love this line - thanks for the chance! Thanks for the giveaway, this collection is great! I am a new follower via bloglovin. ooh I love Botanics! Thanks for the chance! Lovely of you to join the giveaway day! I love these fabrics! I would definitely know what to do with them! And I'm a new follower of your blog (via Feedly). Love the Botanics lines! I'd love to get my hands on some! Thanks for the chance! That's happened to all of us! Thanks for the chance to win! Botanics is one of my favorite fabric lines. Thanks for the giveaway!! I love botanics! Thanks for the giveaway. Love this line and I am hoarding it too! Thanks for the great giveaway! I missed on Carolyn Friedlander's first collection, and then I only purchased some of the Botanics line, so this would be wonderful to win! Thanks for the giveaway. I'm a new, but obsessed quilter. If I won, this would be my second charm pack. Oh! I have been drolling over this line! Thank you for sharing! Nice giveaway- thanks for the chance! Botanics is a great collection! Thanks for the chance to win! Fun line. I originally studied drafting in college. Thank you for the chance to win. I've only bought fat quarters before, never pre cut squares - it would be nice to have those. I think I need a new rotary cutter too! I love that I found your blog and getting inspiration (especially that houndstooth quilt). Thanks for the chance to win! Charm packs are so fun! I do that too! I buy fabric with a plan and then when I pull it out I can't remember what I was going to use it for! Those are quite pretty charm packs, thank you for the chance to win!! Thanks for the chance to win these gems! Love this line! Botanics is a gorgeous collection! Thank you for sharing! I'm happy now as a quilter but back in my younger days I wanted to do a MLSc. Thanks! And I've added you to my feedly reader. I would use these to make a table runner. This line is so beautiful! I love charm packs! Thanks for the chance. The Botanics fabrics are beautiful, thanks for the chance to win! These look interesting. Thanks for the opportunity. Congratulations on getting your MLS. I work in a library - there's no better place to be! Thanks for sharing with us! I'm a new email follower. Can't wait for some great inspiration! Thanks for sharing! I love Carolyn Friedlander, her collections are some of my faves at the moment. Botanics is fab, especially the low volume ones in this bundle! Many thanks for the chance! Hi there, thanks for the giveaway. I'm a real novice quilter but I like these modern and simple designs. Love Botanica and I haven't bought much of it! Thanks for the chance.I think I have the perfect project for the charm packs! I now follow via email! Such beautiful calming fabrics! Thanks for the chance to win! Thanks for the chance! I love Botanics! Botanics is an all time favourite line - thanks for a great giveaway! And i follow on Bloglovin now too! Thanks for a chance to get some of this fabulous line. Botanics is awesome...thanks so much! I love this line! What a great giveaway! Love these. Thanks for the chance to win! Great fabric!! Thanks for the chance to win!! What cute fabric! I don't think I'd seen the line before. Thanks for the chance to win some. love the fabric, I think I can come up with a plan for using them. I love Botanics! Hope to win this giveaway! Thanks for the great prize. Would make a great low volume quilt. Love Charm Squares Thanks for the giveaway. Love the Botanics fabric!!! Hope you have a great Summer and thanks for the giveaway chance! I would love to give these a new home! Thanks for the giveaway. Hello, Anna. I enjoy cross stitch, also. Have fun with your giveaway! Very nice giveaway. Thanks for the chance to win. Thanks for an opportunity to win these great fabrics. And I (now!) follow you on Instagram. Giveaway day is such a fun way to find new people to follow! Thanks! Quite like Botanics. I see HSTs in my future. Thanks. I love calm fabrics after teaching all day. This is pretty. Nice giveaway! I am feeling lucky! Your giveaway fabric looks great! Would love to win! Ooh lovely! Boo for forgetting plans but Thanks for the chance to win! Woohoo, I love this line! I'm not sure what I'll make with Botanics either. I just know that I love it! What fun fabrics, thanks for the giveaway! I can definitely come up with a plan for these charms! Fun fabric! I'm sure I could figue out something wonderful with them! The charms look like low volume...which I could really use!